TEDxSanDiego brings together a collection of doers and thinkers, innovators and creatives, explorers and visionaries, teachers and learners, then seeks to illuminate, inspire and activate those individuals as a way to expand horizons, change perceptions, incite action and foster new connections. 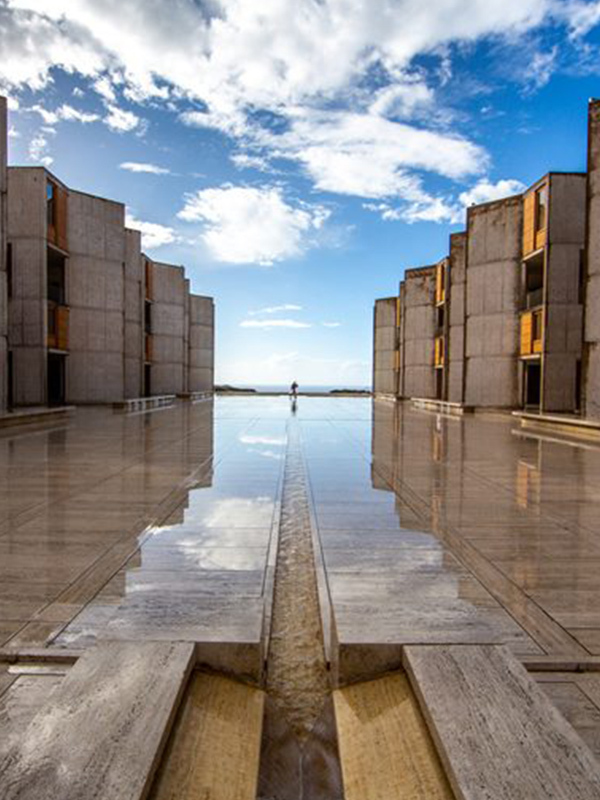 TEDxSanDiego is a not-for-profit, volunteer-driven organization. We were approached to help them understand Facebook advertising on a more strategic level. There was no tracking in place, no audience segmentation, and only “boosted posts” happening at that time. 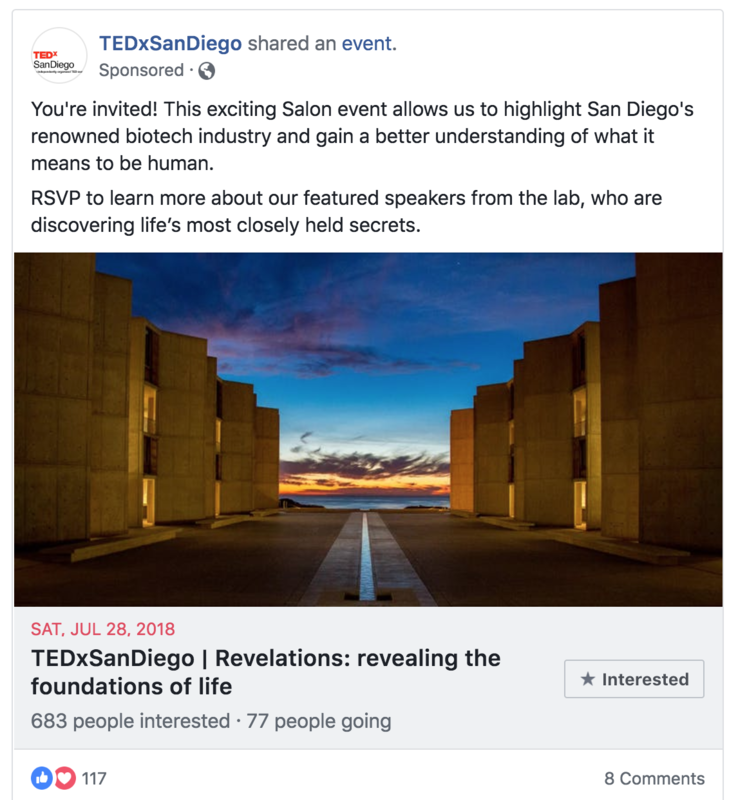 Our first project with TEDx was to help advertise a niche “salon” event called Revelations: revealing the foundations of life, explores the subject of human biology, from inside the research lab to the world of applied biology. First, we installed the Facebook pixel on both the website, and the eventbrite page where tickets are sold. 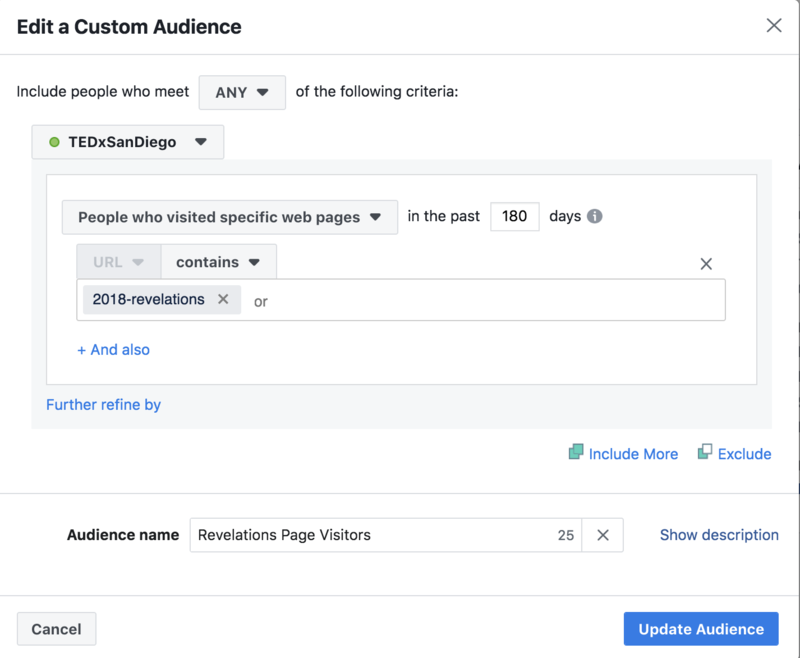 We created a Facebook event to leverage the RSVP angle, so when someone hits “Interested” their network sees it, and this function allows us to retarget them as well. It was important to try and create audiences that would be interested in this specific niche event. We broke out the groups by interest/topic to test who would convert the cheapest or most often. For example: Cellular Biology VS Neuroscience. Then we created retargeting audiences based on pages people were visiting, such as the landing page for the event itself. 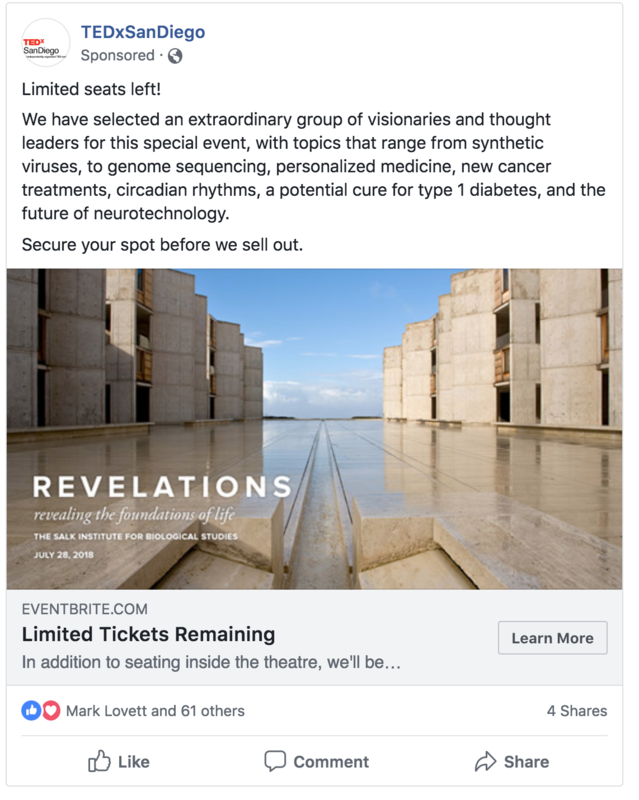 Everyone who clicked on the Facebook event and RSVP’d or who visited the specific event’s landing page on the TEDx website, was then sent directly to the ticket sales page. As the event got closer, we could send custom messages to everyone who still had not bought their tickets. Overall we had a 600% ROI on ad spend. One thing that I love about this campaign, is how the “Event RSVP” objective brought in more purchases than the straight conversion click to website objective. This just proves that you can achieve results in more than one way when you get creative. What was most interesting about the results was how much better the cold/new audiences performed in comparison to the retargeting groups. We are so happy TEDxSanDiego has better ways to test and track revenue as a result of Facebook Advertising. The screen grab below represents one of our campaigns, where you can see the Cellular Biology audience as the winner in terms of cost per purchase and amount of purchases.